Dog Friendly Pubs in the Highlands, Scotland including Aviemore, Skye, Inverness and the Black Isle. Enjoy a glass of wine or try a local Skye Ale at Saucy Mary’s Lounge Bar. The perfect way to unwind at the end of a busy day exploring the Isle of Skye. Please note that some dining areas may be restricted at certain times. Relax in our family-friendly hotel overlooking the harbour in the charming village of Cromarty. Dogs and their well-behaved owners are welcome in our conservatory, bar & sitting room where you can enjoy drinks, lunch, dinner or just a coffee beside the log fire. Ellie, our resident miniature schnauzer, looks forward to welcoming you! Boutique-style bedrooms two of which are dog-friendly. Water bowls, treats & details of local walks are available on request. 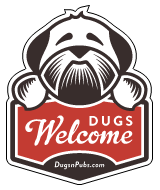 Dugs welcome in the Bar and all our rooms. The Cluanie Inn is situated on the A87 Road to the Isles. Dogs welcome in the bar and also in certain rooms (check website for details/additional charges). There are a total of 60 dog friendly listings in the Highland Pubs category. Please log in, or sign up as a member to view all listings.